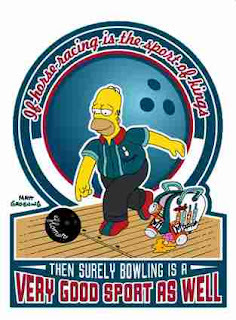 And just on a total tangent, people who bowl very infrequently, like me, sometimes affect psuedo-serious bowling gestures for no good reason. The way you walk up to the line, or hold your hand over the little air-vent, or try to spin the ball. It's the same like walking around a pool table after you make a shot, or how people talk strangely on a witness stand. Even when you glare at them when your attorney says not to.